I am now finished with my mesh. I have a body and alphathingy group in milkshape. Okay, for the shoes....if you have the shoe mesh already made then you need to adjust the feet to fit the shoe shape. Also depending how high heel the shoe is will determine what bone you assign it too. 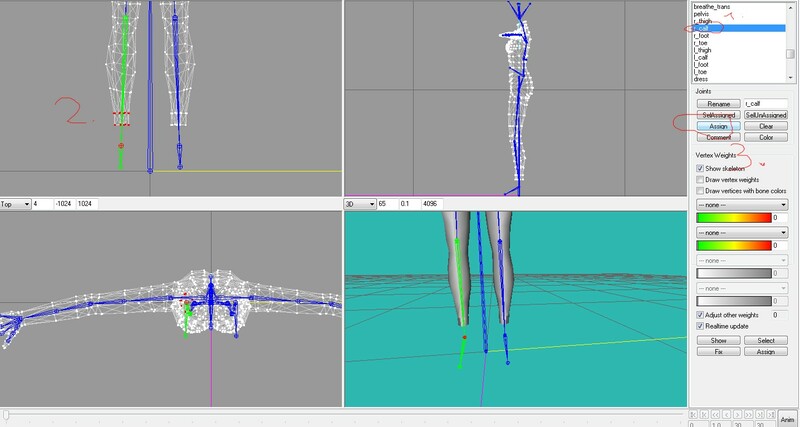 I usually assign my high heel shoes to the calf bones because if the foot is rotated in an animation the outcome is horrid. Now for the dress this is where you *MUST* know how to use weights. Weights will be the only possible way your dress assignment will turn out the way you want it. If you want just make a heel and put to the feet you just need to assign your heel to right foot, left to left right to right! BUT if you make full shoes i do it like this! and the you unhide your Shoes group!!! but hide the body! remeber left shoe to left calf, right to right! If you want assign dress dont touch the body group, hide the body group and do it like this! spine2 select everything till the green joints end! spine 2 select everything till the green bone end and assign! Then for bottm part of dress or any outfits, select pelvis joint and then select all till the end of the green bone but not shoes! then select l_thigt, here i used other outfit so i can explain better! then select r_thigt and select liek this! so this is how assign outfit like you made, but if you made outft which has a hands and something else you will need to assign the hands and others! So i dont know explain good, i try explain best i can and i hope you will get somethinhg! This is way i assigning ! hope somone will help more! and i forgot to say that you click on the aniamtion buton on the bottom of milkshape and try rotate joints just like you doing a animation and you will see if it works!